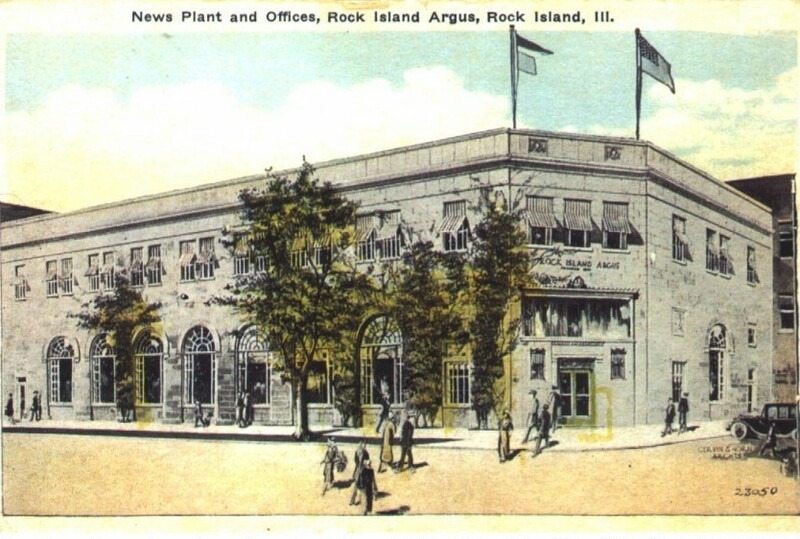 The signature “Cervin & Horn Archts” at the lower right corner tells us that today’s postcard of the new Rock Island Argus building was created from an architectural rendering or drawing. Benj. A. Horn of that firm designed the building in 1925, calling it Italian Renaissance in style. From our perspective today, it seems as though any building with one or more circular-topped windows and some classical detailing was called Italian Renaissance in the 1920s. It is interesting to note that the 1922 year-end edition of the Argus featires a different version of a Cervin & Horn design for the building on the front page. Nowadays, we see the $300,000 building as one of the outstanding Art Deco buildings in Rock Island. It was built by Henry W. Horst, who was known for his quality workmanship. He refused to cut corners and compromise that quality when he built over 200 Rock Island homes under contract to the federal government in 1918. Those homes, too, were designed by Cervin & Horn. The steel-framed Argus building has a simple rectangular shape, with a plain parapet atop the carved cornice. It is constructed of hard Indiana limestone, with a very smooth finish. It is interesting to note that the original intent was to cover the stone with ivy, and pockets were created in the surrounding sidewalk to accommodate the plantings. The smooth surface and restrained yet elegant detailing give the building a very sleek and sophisticated look, and justifies our calling it Art Deco in style. A few small panels, carved with classical details, and the huge round-topped windows are the predominant external decoration. The decorative carvings were intended to reflect Greek mythology and its hundred-eyed Argus figure. The carved panel on the north side contains a two-headed peacock sitting in an urn, with stylized tailfeathers spread behind him. It certainly does not look like our image of the watchful Argus. But the symbol is appropriate – after his death, the goddess Hera transferred Argus’ eyes to the tail of the peacock. The angled entrance on the northwest corner presents an equal appearance to both of the main streets it faces, with doors framed in bronze cast in a flowing design. Notice the small rectangular grilles which cover openings on either side of doorway. The large window we see above the entrance functioned as a bulletin board, where the latest news, including sports scores, was posted. This was a feature held over from an earlier Argus building on 17th Street. In modern days of instantaneous news – sometimes more instant than we want – we can only imagine the gatherings outside the newspaper, watching for news to be posted as it developed – War Declared; Armistice Signed; 5th Inning -Yankees 6, Giants 4. During the shootout in Market Square where Connor Looney was killed on October 6, 1922, a large crowd was nearby at the Argus, watching World Series scores being posted as the game was played. As electronic media developed that could reach every household easily, the instant news bulletin was no longer needed. Now a new sign covers the bulletin board window. Originally the first floor windows had fanlights in the upper portions and a decorative pattern of small rectangular panes on either side of the large center pane in the lower portion. The large pane was there for a special reason – so passersby could observe the workings of the new $60,000, 100 horsepower Argus press, located on the east side of the first floor. In more recent years, the glazing pattern of windows has been changed, with tinted rectangular panels in the old fanlights and modern looking panes at either side of each large pane. Originally the editorial offices were on the second floor. Since the joining of the Argus and the Moline Dispatch in 1985, all printing takes place in Moline and there is no longer a press in the Argus building. The newsroom now occupies the first floor, a much more appropriate use for that elegantly appointed space. Step inside and marvel at the beautifully preserved coffered ceiling. Note the original light sconces on the walls and the chandeliers. The arched tops on two of the windows are covered in panels with relief depictions of serpents, birds, and foliage. The long curving counter is marble, and the floor is slate. Even the radiator covers are exquisitely detailed. An iron staircase with a wood and iron handrail rises to a mezzanine, which is supported by square columns. It is reported that the architects were instructed to “make it such a building as the organization and the community could view with continuous pride.” We think they achieved that goal – and we credit the Argus owners through the decades for maintaining its home in such beautiful condition. This article by Diane Oestreich, slightly modified, originally appeared in the Rock Island Argus and Moline Dispatch on June 16, 2002.